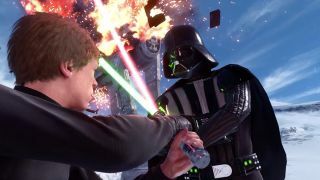 Star Wars: Battlefront will let you play as Darth Vader and Luke Skywalker among a host of other series icons, but what difference does it make in a multiplayer shooter context? I don't know to be honest, but the above video outlines how each will wield their signature weapons and/or abilities on the battlefield. The video also outlines some of the game modes that focus on skirmishes between 'hero' and 'villain' playable characters. The aptly titled Heroes Vs Villains game mode looks like it'll be the best way to perfect each character's specific moveset, but any mode that lets me fell an X-Wing with a lightsabre as Darth Vader is welcome. Star Wars: Battlefront releases this Tuesday. EA detailed the season pass earlier today, which nets you 16 new maps over the course of 2016. Oh, and there are speeder bikes.